I thought I’d lighten things up a little bit this week. As far as school is concerned, this past week has been more of the same: new, confusing grammar until I get it, and hours outside of classes studying so it all falls into place. Past tenses in French are complex to say the least, and we only covered two of the forms among everything else covered! Wrap an intense but fortunately short head cold around it and that was my school week. I’m feeling nearly 100% now, Mom! I’m really fortunate because many of my fellow students have been sick for weeks. A number of people have asked me about my weekends so far, so I’ll see what I can tell you. First of all, Sunday has been the most consistent: 11:00 a.m. church in the morning, followed by blogging, studying a little bit, and watching a movie or 2 into the evening. The only way this “movie” thing is happening is through the generosity of my friend, Dan, who opened up his private movie library to met . It turns out that my Amazon Prime works over here only for a small number of their own TV shows; none of their other content will play in France due to copy write, etc., laws or agreements. Netflix won’t let me change my plan to add streaming (I only have DVD’s from them). Thank you, Dan!! Except for this morning when I ran a 10k race (that’s a story for another time! 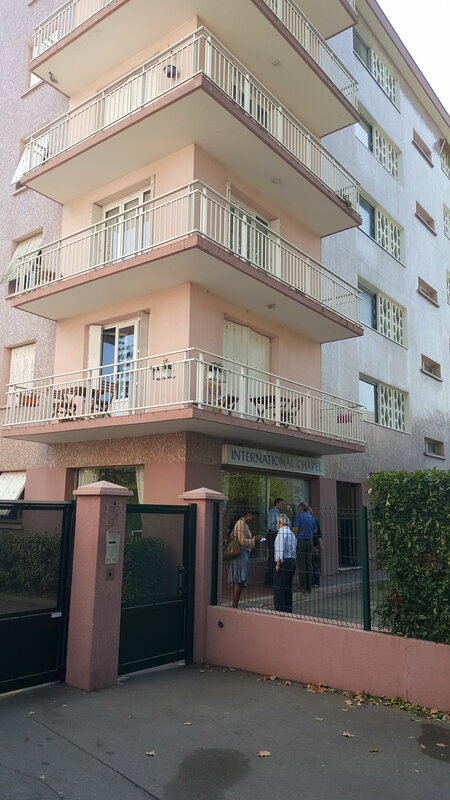 ), church has been at the International Chapel in Montpellier, about a 10 minute walk from my language school. It was referred to me by a fellow African missionary who was here before me. I could attend a French church, but would not understand anything at this point. So, I have been worshiping at an English-speaking church. The pastor has been there for 13 years and is a self-funded missionary! This seemed a bit odd to me at first, seeing that France is so non-Christian. But, there are also a lot of ex-pats and students who speak English here, as well. Singing and worshiping with people from literally all over the world has been very fulfilling. The weekly service and other activities are held ina rented first floor commercial space just barely big enough for the 35 or so congregants and kids. The preaching is solid and the people have been welcoming. There are lots of transients like me, so it is difficult for the pastor to get a lot of ongoing traction. I feel badly for him. I offered to fix things or help with projects, but no takers, so far. Wish I could do more. My Saturdays have been adventurous from a different perspective. ILA (my school) provides optional extra-curricular trips once-per-week to a nearby historical town or site of interest. The trips are for groups up to 30 students and cost between $30-45. Food, snacks and drinks are not provided. A comfy charter bus transports us. They provide a guide (one of the teachers) and a page or two of appropriate places and photos of interest, which they talk about both on the bus and while there. Then, they dismiss us to go off on our own after making sure we know what time to meet and where for the ride back to Montpellier. I didn’t go last weekend because I was sick, but I have been on three other trips. Let me quickly tell you about where I’ve been. Pointing at Auges-Mortes in the distance. My first trip was a half-day to the historic village of Augues-Mortes and a nearby salt production facility. This region has an ancient legacy of salt production. The old village, surrounded by modernity, is about 20 minutes to the east and is famous for its 30 foot tall, hundreds of years old, intact, perimeter stone walls, turrets and ramparts. The quaint village inside is mostly supported by tourists. This is the off-season (fortunately for me! ), so it was pretty quiet, relatively speaking. The second half of the afternoon was at a large salt production facility. I have to admit that I’ve never considered where salt comes from! There are large evaporation ponds that take up acre upon acre, which are then bulldozed and transported to be dumped onto huge mountains of pure salt. It is then processed down to various grades for commercial and home use. The really interesting part for me was getting to walk up to the top of one of the “mountains”. From there, I could see the pinkish hues of the ponds that are this industry’s hallmark. Additionally, there were also small flocks of flamingos (of all birds!) scattered throughout. Not sure what this is about, but they sure are pretty! I’ve not seen flamingoes anywhere else, so far. The second trip was more far more rural and about a 45 minute drive north from Montpellier. Our destination this time was Saint-Guilhem-le-Desert (think “William” in French), a small Medieval village carved - literally - out of two parallel 1,000 foot high mountainous ridges. Not that high, but very dramatic! The hilly village may run a quarter of a mile in length, but it is only two (maybe three in some places) cobble-stone streets wide - and those narrow streets may barely be able to permit one small car to pass. The homes and shops are built into the existing stone. Doorways are arched and low, as are many of the shop ceilings. The homes appear to be more on the perimeters and are either much higher up or much lower than the shops in the middle. I’m not a shopper, so, other than the really cool Medieval church in the center square and it 1,000 year old tree, there wasn’t much for me in town. So, I high-tailed it into the surrounding hills and trails for a couple of hours of much needed nature therapy. The trip this past weekend was the best, in my opinion, both from experiential and cost perspectives. I say cost because it would have been about $40 US, but I went for free! Earlier in the week, it was announced in class that the school was looking for blog articles (with photos) for its web site. So, I seized the opportunity and re-wrote my Week 1 blog. They loved it. And, in my opinion, this was the best trip by far to this point. We spent all day at two amazing places about an hour or so northeast’ish: Pont du Gard and the city of Avignon. Pont du Gard is a 2,000 year old Roman aqueduct (now a national historic tourist site) which they built across a river as part of a 40 mile long water supply project for the city of Nimes. Incredibly, this stone and concrete system only had a fall of 55 feet its entire length! The dramatic three story arched structure was used both for the water-transporting aquaduct as well as a bridge. Much to my surprise, the water portion was at the very top, at least 100 feet above the river! Palace of the Popes: like something out of Lord of the Rings! Avignon, another 20 minutes farther, is the “county seat” for its region. It is a small city in its own right in addition to its historical heritage. Avignon is by far most famous for being the headquarter of the Roman Catholic Church for almost one hundred years, starting back in the early 1300’s AD. This ended up being “temporary” as the Pope returned to Rome to stay after this stint. However, the Church took its buildings seriously, and in a short 20 year span, built much of the amazing Palace of the Popes, which dominates the northeastern portion of the city. I paid the 13 euros for the tour with sound and am very grateful I did so. While the vast building(s) are empty of any furniture, the scale, architectural and construction achievements are breath taking. My favorite part was when I discovered that one grand cathedral-sized hall, with high, vaulted stone ceilings sit on top of a nearly identical hall below! How did they do this!!?? They served different purposes. One was for official ceremonies and worship services, the other for banquets. And these were just two portions of the incredible two hours I prowled around the Palace.